In order to concatenate string, use the “+” notation. See screenshot below. In the example below, I am concatenating value from a Basic Tag called “System.SEP01_NAME_LONG” with a string ” WELL TEST”. 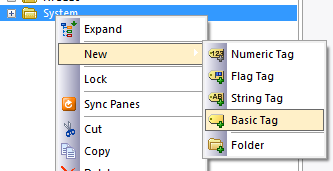 Note that the Basic Tag (“System.SEP01_NAME_LONG”) has a value of “SEPARATOR”. The screenshot below shows what I meant by Basic Tag.